Finally my professor assigns a dystopian fantasy to read. I was beyond excited to start reading Life As We Knew It by Susan Beth Pfeffer. Right. This was all before I started reading the book. Told in journal entries, 16-year-old Miranda’s life is like any typical teenager. Somewhere in the background, Miranda mentions in passing that a meteor is going to hit the moon. She complains about the amount of moon themed homework she has to do. No one thinks much of it other than the event can be viewed from earth. Of course, this all changed when the meteor hits the moon just right, just at the sweet spot and the meteor knocks the moon closer to earth. Panic, earth quakes, title waves, etc. the normal end of world stuff happens. Life As We Knew It does an excellent job of showing the slow deterioration of civilization. I’ve read other reviews that had issue with the science behind the moon being hit by a meteor. I had no issue with that. Call me crazy but when the narrator is a whinny girl who is beyond naïve, I take it with that more than anything. The entries start just prior to a meteor hitting the moon and initially her accounts are self-absorbed and annoying. The small saving grace of the story is how much Miranda grows as a person by the end of the book. I have no desire to read the other books in the series. I am glad that it is over. When is this class done? 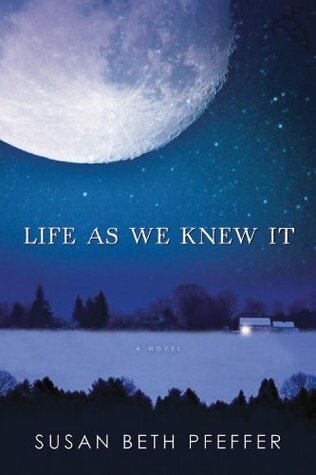 This entry was posted in Post Apocalyptic, Science Fiction, Young Adult and tagged dystopian fantasy, Life As We Knew It, post apocalyptic, Science fiction, Susan Beth Pfeffer, YA Book. Bookmark the permalink.